Bag filter systems are ideal for use as an economical and easy-to-use duplex filtering system. 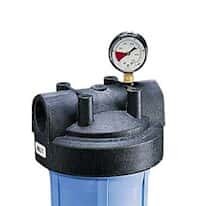 Select the right bag filter by knowing the temperature/pressure ratings of your system. Determine if the housing is suitable. Understand the flow rate of the fluid to be filtered. Determine the level of filtration required for bag selection. Calculate the pressure loss for a filter bag. Calculate the pressure loss of the bag housing. Add the pressure loss of the vessel and bag together to get the total pressure loss across the filter once the bag is installed. Consider the startup pressure loss. In most cases, the startup loss is at about 2 psi. Always change the bag before reaching a 20 psi loss. When in doubt, use a filter with the lowest pressure loss (normally 2 psi) or use multiple filters installed in parallel.